For those of you desperately hanging on to your iPhone 4 or 5 and delaying your upgrade because you're daunted by the size or price of the iPhone 6 and 6s, rejoice. 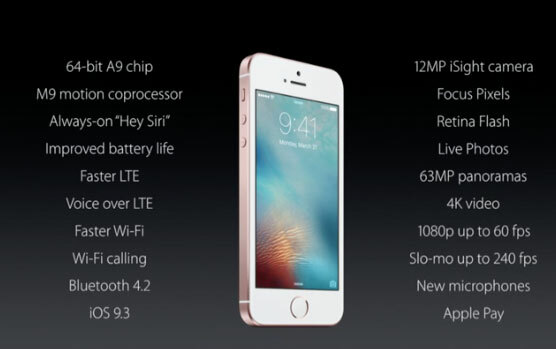 Apple today, as expected, announced the iPhone SE, essentially the iPhone 6s packed into a 4-inch, iPhone 5s-like, body. According to Apple CEO Tim Cook, "the iPhone SE is the most powerful 4-inch smartphone ever made." Like the iPhone 6s, the SE runs on Apple's A9 chip, which will make it three times more responsive than the 5s, with three-times more powerful graphics to improve your game play. 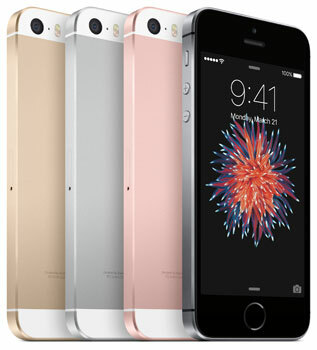 Like the iPhone 6s, the SE will be available in silver, space grey, gold and rose gold. You can pre-order the iPhone SE this Thursday (March 24, 2016) for delivery or pick-up a week later (March 31, 2016); it'll run you $399 for the 16GB edition or $499 for 64GB of storage. That's $50 less than what AT&T, T-Mobile and Verizon are currently selling the 5s for (Sprint has the 5s for $300). There are also monthly equipment installment plans for an unlocked model from Apple starting at $17/month. Plans from the major cell carriers will be coming forthwith, but expect the pricing to be along the same lines. Apple also announced an upgrade to iOS, v9.3, will be available sometime today (ours just came through). Among the new OS's most prominent additions and improvements is Night Shift, which reduces the cool blue light emanating from the display that, according to Apple, can adversely impact your ability to fall asleep and stay asleep. Night Shift also can adjust the screen's color temperature, along with the brightness, to match ambient light. That means your phone won't show a cold white display when you're reading under a warm, incandescent lamp. The Apple Health app will now recommend apps that are compatible and share data. And, anything you create in Notes can now be passcode or Touch ID fingerprint protected. So now your notes can be for your eyes only.